In the years after the housing bubble burst, rentals became more common in almost every major U.S. city, according to a study by Marketplace and APM Research Lab (an arm of American Public Media). That includes cities long thought of as “affordable” places to buy a home, such as Cleveland. 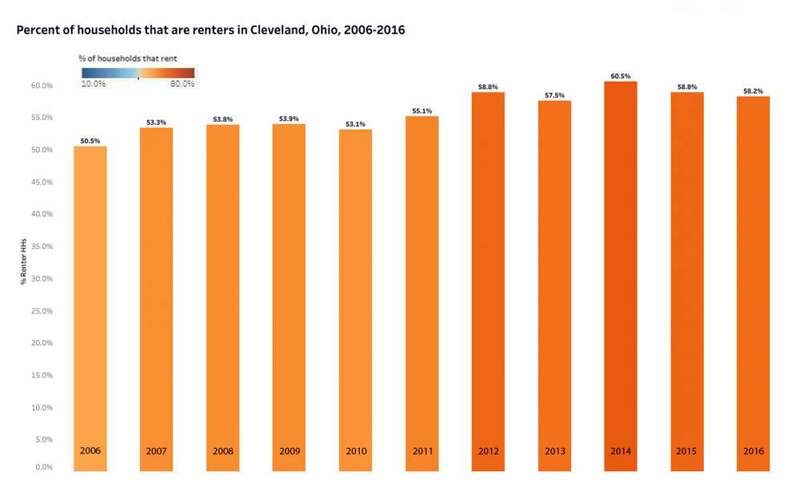 The proportion of Clevelanders who rent is nearly 10 percentage points higher today than it was before the Great Recession began. According to U.S. Census data, renters made up 50.5 percent of Cleveland residents in 2006, compared to 59.6 percent of residents in 2017. Among that growing group of renters are many who are doing so reluctantly, because the inventory of affordable for-sale houses in many areas of Northeast Ohio has dwindled in recent years. “It felt really big when we got here,” Mike added. But now, “it feels like we’re busting out of the place.” By “we,” the couple, who are in their early 30s, also mean their two cats and their dog, a four-legged ball of energy named Max. Besides more room for their pets, the Cornacchiones want a bigger place to start a family. So, for the past several months, they’ve been furiously house hunting, hoping to find something in the $180,000 to $200,000 range. But with for-sale properties in short supply, they haven’t had much luck. “It’s incredibly frustrating,” Mike said. “Emotional roller coaster,” Rachel added. So for now, the Cornacchiones will keep renting. And they have lots of company. According to census data, the ratio of renters-to-owners in Cleveland went from about 50-50 prior to the Great Recession to around 60-40 today. A similar decline in homeownership has also played out in dozens of cities that have commonly been thought of as “affordable,” such as St. Louis, Charlotte, North Carolina, and St. Paul, Minnesota, according to APM Research Lab. Joel Elvery, an economist at the Federal Reserve Bank of Cleveland, says there are several reasons for the shift. First, the city’s population shrank in the years after the recession, from around 415,865 in 2007 to about 385,525 in 2017—a decline of about 7.3 percent. Many people who had the money to move were homeowners, Elvery said. Then, “there were a lot of people who wanted to move out of Cleveland, but weren’t able to sell their homes,” he said. As a result, those homeowners either rented their properties out or sold to investors who converted them to rentals, taking those homes off the market. Also driving the rise of renting was the wave of foreclosures when the housing bubble burst. “The city of Cleveland got hit by foreclosure earlier than other cities and deeper than other cities,” Elvery said, “and foreclosure almost by definition is moving people from ownership to rental.” That’s because it is extremely difficult for a person to get a home loan once they have a foreclosure in their credit history, he said. The decline of homeownership in Cleveland is also connected to growing poverty. Today, about a third of Cleveland residents live below the poverty line. That’s up from roughly a quarter of residents before the recession. Another reason there are fewer homeowners is that banks have tightened their mortgage lending standards, said Craig Helmstetter, Managing Partner at APM Research Lab, which recently studied the decline of homeownership in dozens of U.S. cities. It’s a trend that has both positive and negative implications, he said. On the one hand, Helmstetter said, it was too many mortgages, driven by subprime and predatory lending, that fed the housing bubble and left many homeowners with underwater loans when the market tanked. The connection between wealth-building and homeownership is one that Rachel and Mike Cornacchione think about a lot. “The money we pay in rent right now is going to nothing,” Rachel said. “It’s housing us but that’s about it,” Mike added. Their current apartment is not an investment that can grow in value over time, he said. For now, the only thing that’s growing is their desire to move out.